Imported from Tokyo, these discrete new camera bags are as fashionable for a stroll through SoHo or a walk down Roppongi Hills. A&A uses the philosophy of understatement and balance in the design of each case. No flashy labels, no Nike™ swoosh or other advertisements adorn the outside of these bags — nothing to let the curious know that a camera lies inside. Humble and stylish at once, A&A bags are quick to use when needed and then fast to disappear afterwards when the decisive moments have passed. While modest outside, inside lie all of the tools needed to gain quick access to and maintain rugged protection of your prized cameras and lenses. A&A starts with a camera and slowly builds around it the vehicle needed to assure a proper fit. A&A then expands this idea for a system, to create a properly molded suspension for its valuable cargo. Each bag is tested with a host of system accessories to find the best combinations for each genre of photography. Subtle variations on a theme are offered, so that each photographer may find the fit which is "just right" for their unique style of shooting. The lining of the bags, a soft-combed cotton, is gentle on cameras with painted finish or chrome trim. Outside a combination of supple leather, ballistic nylon and watertight canvas keep the contents of the bag dry and safe. All the materials are soft and pliable to allow the bag to mold to its owner's body — the best protection for a camera, which a rigid case cannot provide. The removable interior dividers use a system of Velcro™ fasteners and nylon straps with tough buckles to make each bag customizable by its owner. A&A does not assume to tell its owner how they should work with their gear, only provide the framework for each individual to best arrange their cameras. A privilege to own, natural to use, the A&A bag utilizes only quality materials. The best double stitching and the most hardy straps and buckles are attached so that your bag may last a lifetime of frequent use. Replaceable padded inserts assure that even if your bag becomes soiled, it may be washed to restore its original good looks. A&A wants to become a part of your photographic workflow. A&A will be your invisible assistant in the field. This site is the official English web brochure for Artisan & Artist and its US distributor and dealers. The USA distributor of ARTISAN&ARTIST* products in the United States is The Photo Village, Inc. Since 1997, the Photo Village, Inc. has been supplying professionals and amateurs alike with the very best photographic gear. 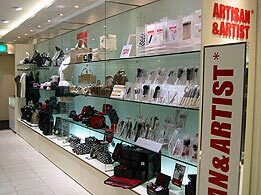 As a premiere dealer of high end precision instruments we are host to the first authorized Leica "Shop in Shop" in NYC. We also are the East Coast distributor for Voigtlander products. We welcome dealer wholesale inquiries as well as retail orders at (212) 989-1252 or by emailing rich@photovillage.com. all information herein ©2004-2011,The Photo Village, Inc.